Who Can Benefit from BCAAs? How Do I Take BCAAs? BCAA Pills vs Powders: Which is Better? Are there Any Side Effects of BCAAs? How Do I Pick a Good BCAA Product? There are hundreds of amino acid types, but the focus of this article are branched chain amino acids. Otherwise known as BCAAs, these acids help your muscles recover from strenuous activity, rebuild, and grow stronger, bigger, and better. BCAAs are essential amino acids, meaning your body needs them to function, but cannot make them on its own. Therefore, you need to get them in your daily diet. There are many benefits of BCAA’s, some you will experience right away, and some that are more of a residual, long-term effect. There are three amino acids in the BCAA category: leucine, isoleucine, and valine. Each acid operates in a different way, and provides different benefits to your body (1). Branched chain amino acids can be found naturally in protein-rich foods. Meats, beans, nuts and some grains all have high concentrations of BCAAs (2). On the other hand, you can also supplement BCAAs in order to get a much higher and more concentrated dose. This option is usually ideal for athletes and people who exercise heavily. In order to help you find a good product we’ve researched & compared the best BCAA supplements on the market right now. CoreSeries BCAA Glutamine is a new BCAA supplement that combines 8g BCAAs with 5g of glutamine per serving. And, like all Transparent Labs products, this supplement is completely free of dyes, unnecessary fillers, and harmful additives. Everything you need – nothing you don’t. 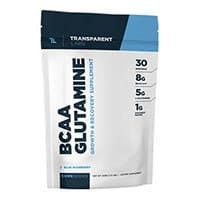 Who makes it: CoreSeries BCAA Glutamine is made by Transparent Labs, a midsized supplement manufacturer that has grown exponentially in recent years. Transparent Labs is all about, well – transparency! Every product they make lists 100% of the ingredients used, and never includes anything unnecessary or potentially harmful. Transparent Labs has built a reputation for being one of the most honest and trustworthy names in the business. 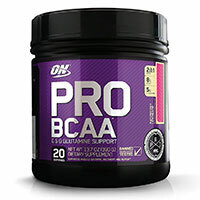 Pro BCAA is a powerful BCAA supplement made by Optimum Nutrition. Combining 8g of BCAAs per serving with added glutamine, electrolytes, and phytonutrients, Pro BCAA is a complete solution for your workout needs. If you read this BCAA product’s online reviews, you’ll see that a lot of people love the fruit punch and raspberry lemonade flavors. Who makes it: PRO BCAA is made by Optimum Nutrition. As one of the biggest and best companies in the industry, Optimum Nutrition has made a name for themselves producing innovative and highly effective health supplements. While best known for their Gold Standard product line, ON makes just about every type of fitness supplement you could think of. 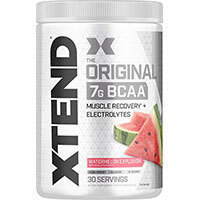 Scivation Xtend BCAAs has been around for a while and this classic BCAA remains one of the most popular bcaa supplements. The combination of 3 essential amino acids in a 2:1:1 ratio, plus added citrulline to boost energy production helps to avoid muscle catabolism both during and post-workout, leading to bigger gains. It is available in 16 different flavors, so if you’re tired of your regular chocolate or banana shakes, this could be a great option for you. Who makes it: Scivation Xtend BCAA is made by the US Company Scivation. It has been on the market longer than many other BCAA products, but still remains one of the most advanced supplements of its kind. This post-workout boost contains 8 powerful ingredients designed to help you recover faster, ready for your next killer session. The 3:1:1 ratio of leucine, isoleucine and valine provides an extra leucine boost for muscle growth. The addition of creatine, beta-alanine and L-carnitine L-tartrate ensures that your muscles get the nutrients needed for recovery, exactly when they’re needed the most. Post JYM Active Matrix is also available in a wide variety of flavors, so you’ll never get bored of this post-workout hit. 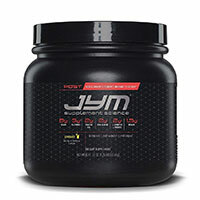 Who makes it: Post JYM Active Matrix is made by JYM Supplement Science, a reputable US company that won ‘Brand of the Year’ at the 2018 Bodybuilding Awards. MusclePharm BCAA 3:1:2 Energy provides 6g of BCAAs in a 3:1:2 ratio, designed to reduce damage to muscle tissue, supporting lean body mass. The addition of caffeine, green tea extract and ginseng helps to keep you alert and motivated, even after the toughest of workouts. 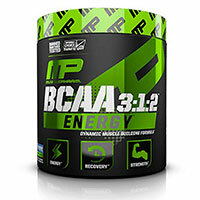 Who makes it: MusclePharm BCAA 3:1:2 Energy is made by the Californian company, MusclePharm. This company was established by current and former athletes, with the aim of creating and marketing effective, rigorously tested products. 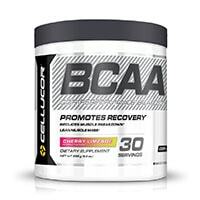 Cellucor COR-PERFORMANCE BCAA provides 6g of BCAAs per serving, in a 2:1:1 ratio of leucine, isoleucine and valine. These branched chain amino acids are instantized to make them more soluble in water. It is designed to help you work out harder, for longer and recover more quickly. At only 5 calories per serving, with less than 1g of carbohydrate, this is a great option for athletes wanting to maintain lean muscle mass. Who makes it: Cellucor COR-PERFORMANCE BCAA is designed and manufactured by Cellucor, an award-winning sports supplements company based in the US. Cellucor aims to provide high-quality, thoroughly-tested sports nutrition products. BSN Amino X is an instantized BCAA supplement. Containing a full 10 grams of micronized amino acids per serving, Amino X is instantized to mix easily. With several tasty flavors available, you’ll actually look forward to taking your amino acid supplement when you go with Amino X! The only downside is that the individual amounts of amino acids are not disclosed. 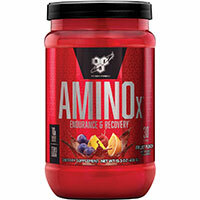 Who makes it: Amino X is made by BSN, a large-scale manufacturer of supplements and other health products. BSN’s motto is “Finish First”, and their goal is to help their customers do just that. By creating innovative and effective supplements at affordable prices, BSN is changing the game and helping their customers achieve the bodies they have always dreamed of. Best BCAA is a simple BCAA powder made by BPI Sports, and offers 5g of BCAAs per serving, combined with 1,000mg CLA and added agmatine. Its unique formula makes it easier to digest in the body, which means you’ll get the full benefits of bcaa in each dose. Plus, it’s affordably priced. 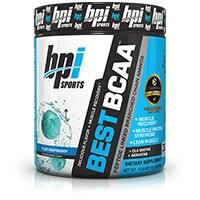 Who makes it: Best BCAA is made by BPI Sports, a new but rapidly growing sports nutrition company. Founded just 5 years ago in 2010, BPI Sports has quickly grown into a powerhouse in the industry, and is today known for developing high quality, innovative and extremely efficient products – all at low, reasonable prices! BulkSupplements BCAA Powder is an affordable source of high-quality branched chain amino acids. It’s formulated in a 2:1:1 ratio (leucine:isoleucine:valine) which is a well-researched formulation. This is pure BCAA powder with no other ingredients besides lecithin (1% or less of the total volume). And since it’s packaged in bulk without flashy packaging, it’s very affordable. 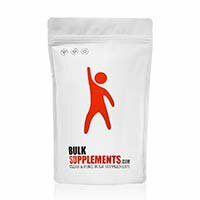 Who Makes It: BulkSupplements, as their name suggests, is a bulk provider of high-quality supplements and raw ingredients. They use simple, no-frills packaging and bulk quantities to provide the lowest prices possible. They also lab test all their ingredients to ensure quality, purity and consistency. BCAA 5000 is a great product from a brand that’s exploding in popularity: EVL Nutrition. With a combined 5g of BCAAs per serving, this supplement provides essential ingredients with no unnecessary fillers or junk. It’s a great value at around $0.50 per serving, but it does have a rather large serving size of 8 capsules per day. Who makes it: BCAA 5000 is made by EVLution Nutrition, a new but rapidly growing supplement manufacturer. Founded by former BMX competitor Mike Spinner, EVLution Nutrition started in 2013 and has already amassed quite the following of loyal fans. With an already impressive lineup of products, we’re excited to see what EVL comes up with soon. 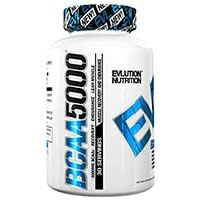 Bottom Line: EVL Nutrition BCAA 5000 is a great product from an up-and-coming brand. If you’re an active individual, you know the importance of eating healthy and ensuring that your body gets enough nutrients. For athletes, strength trainers and fitness enthusiasts, the daily dietary needs are well above those of an average individual. If you work out regularly, your body will crave additional nutrients. The official dietary guidelines are just a starting point, meant for the average, relatively active individual (3). If you’re an athlete or weight lifter, your diet plan might look a little different. Primarily, you’ll need extra protein, which serves as the building block of healthy muscle. And the building block of protein? So, what exactly are amino acids? Basically, amino acids are organic compounds that combine to form proteins, which are an essential part of many processes in the body (4). Amino acids are vital for many functions of the human body, and even more important for strength trainers. They also help to build and repair muscle tissues, among many, many other uses in the body (5). The average person will likely get enough amino acids from their daily diet to function normally. However, that is sometimes not the case for athletes, and especially for bodybuilders. Fitness enthusiasts need extra BCAAs in their body, in order to keep up with the strain they put their bodies through. Weightlifters can have a hard time getting adequate branched chain amino acids in their diet. Luckily, there are BCAA pills and powders that can help supplement your natural intake. The top-of-the-line BCAA supplements will provide a high dose of leucine, isoleucine and valine in an easy and convenient package. Capsules can be taken with water, while powders need to be mixed into a liquid, such as water or milk. Higher quality BCAA powders will have a tasty flavor, so you’ll actually look forward to taking them after your workout. Some products will also contain additional ingredients meant to speed your recovery and help build muscle, such as beta-alanine and citrulline. Increases muscle endurance – BCAAs can protect and fuel your muscles, allowing for longer workouts. They help delay mental and physical fatigue and muscle pain, allowing for more intense exercise and increasing the results of your efforts (6, 7). Prevents muscle breakdown – BCAAs can also help to prevent exercise-induced muscle breakdown (8). This helps reduce muscle soreness, speed recovery, and improve muscle growth. Promotes protein synthesis – BCAAs have been shown in clinical studies to promote protein synthesis, which is essentially the process of rebuilding damaged proteins in the body (9). This helps repair the damage you do to your muscles during exercise. Promotes muscle growth – by activating protein synthesis, BCAAs help to increase muscle growth after exercise (10). Speeds up recovery – by adding a good BCAA supplement to your diet, you can speed your post-workout recovery significantly, due to the above benefits. Helps shed fat – by assisting your body in using fat stores for energy during workouts, BCAAs can help you drop unwanted fat from your body. Helps increase muscle tone – if bigger, more defined muscles are what you’re after, BCAAs can help. Prepares your body for muscle growth – in essence, BCAAs help prime your body to grow muscles. This will increase your results and make your time at the gym more efficient. Absorbs quicker than amino acids from food – amino acids in supplement form absorb significantly faster than those found in whole foods. See the explanation below. A wide range of people can benefit from taking branched chain amino acid supplements. Men of all ages – Just about any man (over 18 years old) can benefit from additional BCAAs in their diet. Especially for those who are active, these supplements can have a huge positive effect. Women of all ages – Both sexes require adequate amino acids to achieve the best results. Any woman over 18 who is active can benefit from adding a BCAA supplement to her diet. Generally, these supplements don’t contain many gender-specific ingredients. Athletes, bodybuilders and fitness enthusiasts – Anyone who is active will greatly benefit from taking a BCAA. These simple supplements will help you lose more weight, build more muscle, and recover quicker. BCAAs for bodybuilding is highly recommended. Vegetarians and vegans – BCAAs are found naturally in foods, but the best food sources are typically meat products. If you do not eat meat, you’ll have a harder time getting a sufficient amount of amino acids in your diet. Adding a BCAA product to your diet can help greatly. First and foremost, you should always follow the instructions found on the product packaging and should always speak with your doctor before taking any supplements. This goes for any supplement. Do not take more than instructed, unless you ask your doctor first. As far as when to take BCAA supplements, there are several times throughout the day where they can be beneficial. Some of the most beneficial times are before, during or right after your workouts. Most of these supplements come in powder form. Many people mix them into water on their own, or add them into shakes with other supplements, fruits, milk, etc. If you plan to consume your shake during your workout or on the way to the gym, using a BlenderBottle can make that process a lot easier, since you can blend on-the-go. Most of the better BCAA products will blend fairly easily, so you shouldn’t need an actual blender in most cases. BCAA supplements come in one of two forms: pills or powder. Generally speaking, powders are more common, but pills are also popular due to the convenience factor. So, what’s better – BCAA pills or BCAA powders? BCAA powders are generally cheaper, offer more customizable doses, and are more flexible in how they are used. For example, you can throw BCAA powders into your pre-workout or intra-workout drink, you can mix them with other supplements, etc. Also, BCAA powders make taking high doses of BCAA easier. If you’re on a training plan that calls for significant amino doses, you’ll end up having to take a ton of pills to reach the desired amount. With powders, it’s simply a teaspoon mixed into your drink. Lastly, the powder form is almost always cheaper when you look at the per-gram cost – sometimes significantly cheaper. Supplement costs can really add up for regular trainers, so cutting costs without sacrificing quality is always recommended. With all that said, BCAA pills do have some benefits. Mainly, they are a bit more convenient because you don’t have to mix them with anything. Simply swallow a couple to get your dose. They are also tasteless, whereas some BCAA powders might have a harsh taste. Lastly, pills are generally unflavored and don’t contain any additives, while powders are generally flavored. As for the effectiveness of the two different forms, there won’t be much difference. You will essentially be getting the same thing, just in a different form. Powders might digest slightly faster, but the difference is minor. All factors considered, in the fight between BCAA powder vs pills, powders come out on top in our opinion. As with any supplement you take, it’s important to understand the potential for unwanted side effects. Generally speaking, BCAA side effects are mild, and the majority of people don’t experience any negative effects at all. With that being said, certain supplements can cause some side effects. For example, many BCAA supplements include beta-alanine. Beta-alanine is known for one strange side-effect: many people experience a tingling sensation when taking it. This tingling sensation is normal. It will go away once your body gets used to the supplement, or as soon as you stop taking the product. Also, keep in mind that not all BCAA powders include beta-alanine, but some do. Everyone is different, so be aware of your body and be sure to report any unwanted effects to your medical professional. Ingredients – take a close look at the ingredients label to find out what’s in the supplement, how much of each nutrient, and if it contains anything unnecessary. Look for specific dosages of the three BCAAs: leucine, valine and isoleucine. Brand reputation – who makes the product? Are they well known and trusted in the fitness community? You can read user reviews to find out more about the companies, or do your own research. Value for money – BCAAs are not cheap supplements, but that doesn’t mean you should overpay. Generally, you’ll be looking at $0.50-$1.50 per serving, depending on the nutrient content and quality of ingredients. Compare prices by individual serving size. Convenience of use/taste – does the product come in capsules, pills, or a powder? If it’s a powder, does it taste good? Check out user reviews for comments on taste. Just about anyone who works out on a regular basis can greatly benefit from adding a BCAA supplement to their diet. Now that you’ve read through this guide, you know more about these supplements, what they are, what they do, how to use them, and how to find a quality product, all you need to do is make your decision and pick up one of our recommendations today. Lastly, we want to remind you to check back here often. Companies are constantly coming out with new products, and we’re always on the lookout for valuable new additions to our recommendations list. So, please bookmark this page and check back once you use up your current supply of BCAAs!